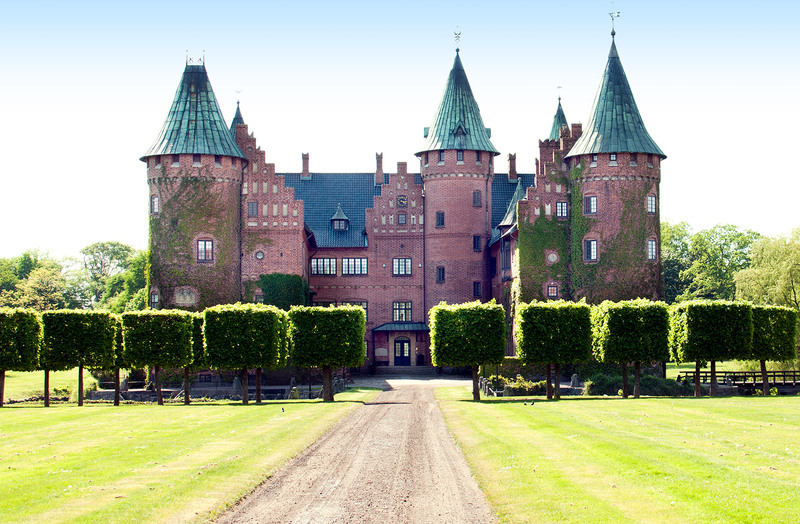 Originally called Eriksholm, the main house was completed in 1538 as a moated red brick castle – 2 period cannons are still guarding the castle. 4 connected buildings surrounding a coartyard and 2 diagonally placed towers along with splendid sandstone decorative columns and sculptures. This great house was ravaged during the 17th C. wars by Danish aggressors trying to retain what Sweden was about to conquer. In the 1750s the remaining outer walls and towers were transformed into a humbler whitewashed manor with an addition of 2 extra towers. By then renamed Trolleholm in order for there to not be any doubt of who was the rightful owner. In the 1880s at the height of Eclectisism Carl Trolle-Bonde gave instructions to the foremost Danish architect of the time, Councillor of the State, Ferdinand Meldahl, to ”restore” the castle to its former glory. Using a copper engraved ”house portrait” from 1678 and the remaining parts of the 16th C. building, Meldahl created a castle with ”a romantic feeling”. This means that the original castle makes up 1/3 of the present house. However, it was quite ”modern”, both in layout and technical amenities like hot and cold running water, lift etc. Most impressive, for todays visitor, might be the great library containing ca 45 000 volumes. Since the late 1980s the largest part of the present building (including a substantial share of its contents) is let to a company who has sold timeshares to a number of well established companies and scientific faculties – thus providing the shareholders with a historical building/venue for their internal and international meetings and social activities. The present owner and his family reside in the former Dower House, a pleasant Edwardian Manor, a couple of kilometers from the castle, which acts as a romantic backdrop on the horizon.